Sustainability Innovators: (left to right) Kirk Hines, Raghu Patil, Randy Sims, Leah Yngve, Kyle Griffith, Ciannat Howett (OSI), Emily Cumbie-Drake (OSI), Kelly Weisinger (OSI, and Jane Duggan (not pictured). Wednesday, Oct. 23 is Campus Sustainability Day. Meet student groups who are helping Emory go green, sign a sustainability pledge, "upcycle" a T-shirt and more during Wonderful Wednesday on Asbury Circle from 11:30 a.m.-1:30 p.m. 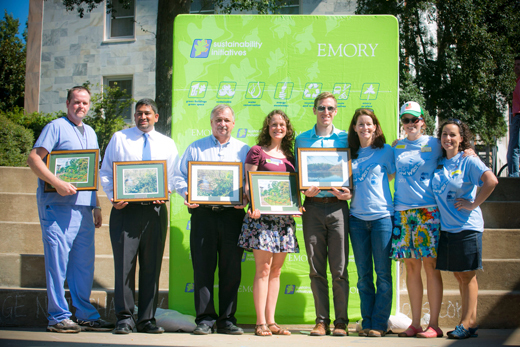 The Robert S. Hascall Sustainability Innovator Awards recognize faculty, staff and students who contribute time, energy and effort to enhancing the health and well-being of Emory’s natural environment and all of its community members. Jane Duggan, anesthesiologist at Emory University Hospital Midtown and an assistant professor of anesthesiology in the School of Medicine. Aware of the amount of waste that comes out of Emory’s operating rooms, Duggan has been collecting clean recyclable materials to be recycled through her home recycling program. This year, she urged the hospital administration to expand recycling opportunities in operating rooms, administrative areas, and public spaces throughout the hospital. She has also convened a group of dedicated staff at EUHM to discuss and propose ways to heighten sustainability initiatives in the hospital and promote behavior change. Kyle Griffith, complex director for Few and Evans halls, Emory’s first-year “Living Green in the 21st Century” sustainability-themed residence halls. Griffith encourages his staff and residents to lead more sustainable lives on a daily basis at Emory. He has inspired students to develop numerous sustainability campaigns, most recently a sustainable laundry initiative. His infectious enthusiasm for sustainability has spread throughout the hundreds of students he has worked with over the years and he has become an essential component toward creating a culture of sustainability in Emory’s student body. Kirk Hines, a registered horticultural therapist. The founder of the Wesley Woods Horticultural Therapy program, Hines has provided organic herbs, vegetables and flowers for Emory's eight educational gardens. Each winter, seeds are sown and seedlings transplanted during patient therapy sessions. Treatment goals are achieved by increasing motor skills, as well as by decreasing depression and anxiety. Some patients take seedlings home and others enjoy knowing that their work contributes to the gardens and student education. His work supports the environmental and social goals of Emory’s sustainability initiative. Raghu Patil, senior program associate in the Office of Finance and Operations at Oxford College. Patil serves as sustainability representative for Oxford College and liaison between Oxford and the Office of Sustainability Initiatives. Through his persistence and skillful collaborations, Patil has succeeded in bringing a comprehensive recycling program to Oxford that is serving as a pilot for the entire University. He is also responsible for facilitating a comprehensive review and update of the Oxford energy metering program and the introduction of “hydration stations” to Oxford. Randy Sims, director of facilities management at Emory University Hospital Midtown. Sims works tirelessly to maintain the hospital’s facilities and meet the demands of Emory’s patients, physicians and visitors. He has spent many hours this year engaging EUHM in the Atlanta Better Buildings Challenge, a Department of Energy campaign to reduce the hospital’s energy and water consumption 20 percent by 2020. Through his work, the hospital received a free energy audit and energy conservation recommendations, and will implement measures that will reduce hospital energy consumption and utility costs. Leah Yngve, a second-year student at Rollins School of Public Health. In just a little over a year, Yngve has accomplished a vast array of sustainability projects on campus and beyond. She has encouraged and improved alternative transportation through work with the Graduate Student Council, Emory’s Transportation and Parking Services, Bike Emory, the Emory Spokes Council and the Atlanta Bike Coalition. She led efforts to conduct a bike and pedestrian safety audit of North Decatur Road and present these findings to the community, as well as provided support for a transportation report published by the Southern Environmental Law Center. In addition, she serves as the vice president of the Rollins Environmental Health and Action Committee and volunteers in the Rollins Educational Garden.